Sebastian Vettel became Formula 1's youngest-ever world champion by winning the Abu Dhabi Grand Prix, with chief rivals Fernando Alonso and Mark Webber just seventh and eighth. The 23-year-old German led comfortably from the front all afternoon, save a few laps before Jenson Button made his late pitstop. 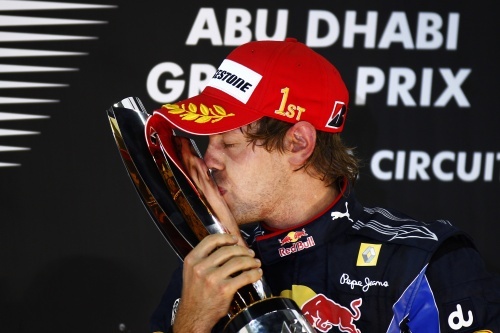 But it was what happened behind Vettel that changed the course of the championship. Pre-race favourite Alonso only needed to come home in the top four to secure title, even if Vettel won, but his day - and title hopes - were ruined when he spent most of the afternoon looking at the back of Vitaly Petrov's car in the lower reaches of the top 10, thanks to an early shuffling of the race order. Instead, Nico Rosberg and the Renaults of Robert Kubica and Vitaly Petrov capitalised on alternative strategies offered by an early-race safety car period to finish fourth, fifth and sixth, and relegate Alonso and Webber down the order. The vital chain of events was triggered by Mark Webber's early pitstop to discard the first set of tyres, on which he was slipping backwards from Alonso's rear wing. Mark resumed on lap 13 in 16th place, behind Jaime Alguersuari's Toro Rosso. Massa had been running closely behind Webber, so Ferrari responded by pitting him to see if he could get out ahead of the Red Bull. When he emerged behind, and Webber lapped 0.8 seconds faster than Alonso next time round, Ferrari made the decision to bring the Spaniard in to ensure he stayed in front of Webber. He did, but that strategy failed to take into account Nico Rosberg and Vitaly Petrov, who had pitted under a safety on the first lap. That meant that although Alonso had Webber covered off, he was nowhere near the fourth place he needed to deny Vettel the title. Not only that, but while Alonso was stacked behind Petrov - with Rosberg another two seconds up the road - Kubica stayed out on a long first stint and jumped up the order. His Renault had started on the harder compound tyre after failing to make it through to Q3, but that allowed a late first stop. Kubica found himself in the thick of the battle for the lead when Vettel and Hamilton rejoined after their stops. With Alonso so far down the order, Hamilton became the biggest threat to Vettel's championship. But the Briton couldn't find a way around the Renault, and by the time Kubica pitted on lap 45, Vettel was 10 seconds up the road and in control. But in that time, Kubica had extended the gap back to Alonso's pack to 24 seconds - plenty for his pitstop. He resumed ahead of team-mate Petrov, with Alonso seventh. Button, who was running just five seconds ahead of Alonso in the early stages, remained in third - easily clear of the Rosberg group by the time he resumed from his pitstop on lap 39. The first-lap safety car period that later proved so pivotal to the championship was, coincidentally, partly caused by Rosberg - the driver to benefit most from it. His Mercedes team-mate Michael Schumacher was delayed on the inside of the track by the defending Rubens Barrichello. Rosberg tried to drive around his team-mate into the chicane and Schumacher spun when he got off line on the exit. Just as he was trying to restart, Vitantonio Liuzzi arrived on the scene, in the middle of a pack with nowhere to go. His Force India hit and climbed up the front of the Mercedes and blocked the track. It was this that prompted Rosberg and Petrov to make their early stops.